Enter in your mobile phone number or e-mail address and we will notify you when City Nav China MicroSD is back in stock. City Navigator China NT provides detailed road maps and points of interest for your Garmin device, so you can navigate turn by turn to the destination of your choice. This map is provided on microSD card (with SD sleve) so just plug it into your compatible Garmin GPS and you're ready to navigate China! 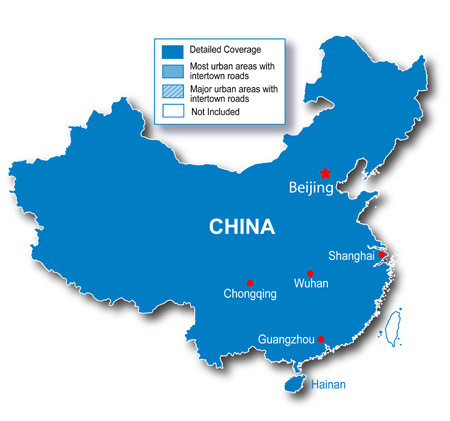 Coverage includes full country coverage with complete intertown road network as well as detailed coverage for more than 980 cities, including Beijing, Shenyang, Shanghai, Tianjin, Qinhuangdao and Qingdao. City Navigator brings you the most detailed street maps available so you can navigate with exact, turn-by-turn directions to any address or intersection. You can also route to over 7 million Points Of Interest such as restaurants, hotels, airports, train stations and more. Full coverage for China, including detailed coverage for more than 980 cities, including Beijing, Shenyang, Shanghai, Tianjin, Qinhuangdao and Qingdao, as well as full country coverage with complete intertown road network. My wife and I are going to China, and needed some help in finding our way around the cities. The Garmin maps are just what we needed whilst walking around unfamiliar cities and locations. Highly recommended. I contacted your establishment for a specific item. I found the staff member I spoke to extremely helpful courteous and efficient. In fact the item, arrived at my home within 24 hours, i.e. a journey across Australia from Brisbane to Perth.